That’s right, there’s apparently a whole slew of professional types who have agreed on nine distinct areas of intelligence. The breakdown goes as follows, simplified for us simple people. 1. Spatial- navigation and building expertise. Famous Person: Frank Lloyd Wright. 2. Naturalist- gardening and horse lovers (eye roll). Famous Person: Charles Darwin. 3. Musical- musician and critic. Famous Person: Ludwig van Beethoven. 4. Logical- math and science chops. Famous Person: Albert Einstein. 5. Existential- philosopher. Famous Person: Aristotle. 6. Interpersonal- people skills. Famous Person: Neil Strauss. 7. Kinesthetic- physical prowess. Famous Person: Bruce Lee. 8. Linguistic- articulate and wordy. Famous Person: John Keats. 9. Intrapersonal- personal introspection pro. Famous Person: Friedrich Nietzsche. Because nothing is complete without an infographic, here’s a really cool one the original article has with it. 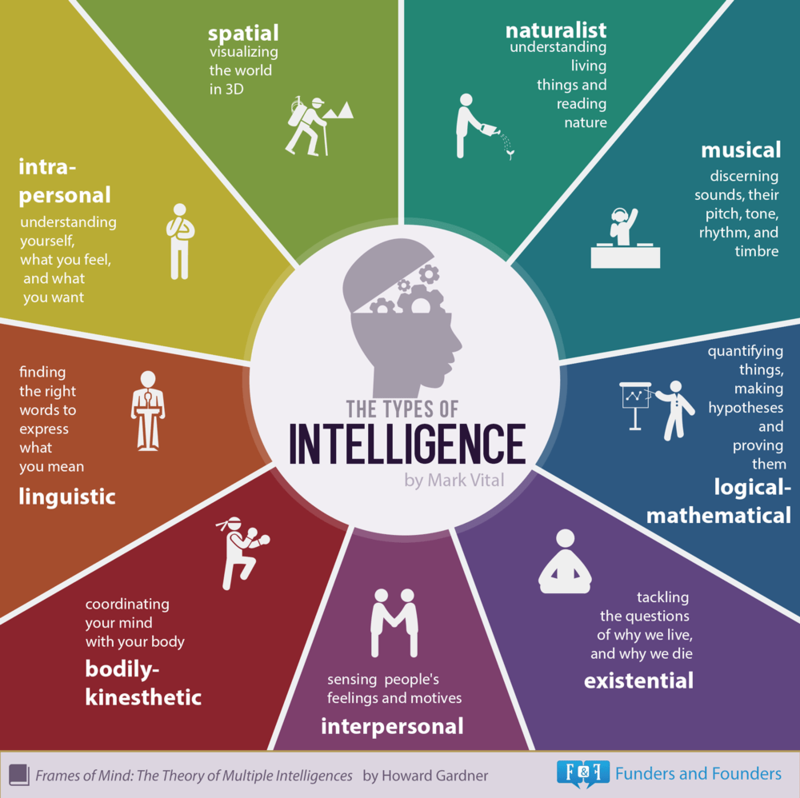 Go check out the fuller article if you want some deeper information on each type of intelligence.